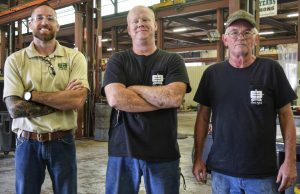 (WACO) – Tucked at the end of South Industrial Drive in Waco is a company using Texas State Technical College to fill its hiring needs. Jerry Boroff, Evans Enterprises Inc.’s plant manager and a TSTC alumnus, receives student resume books each semester from Daniel Bateman, TSTC’s Electrical Power and Controls program’s senior instructor and statewide department chair for Generation, Transmission and Distribution. This summer, Boroff plans to make employment to one Electrical Power and Controls graduate. “It is great when you get to hire guys who do what you are doing,” he said. Evans Enterprises specializes in motor and wind turbine repair for companies and municipalities. The company also does work in crane and hoist maintenance. Besides Abilene, Waco and Wichita Falls, Evans has facilities in Arkansas, Kansas, Missouri, Oklahoma and Washington. Boroff said potential employees need to understand how to use tools and have a knowledge of mathematics. Experienced employees often teach new workers how to use micrometers. “You need to not be afraid to sweat, come to work and earn a paycheck,” said Boroff. Boroff grew up in the Dallas-Fort Worth area and graduated in 2007 with a Bachelor of Business Administration degree with a concentration in finance from Texas Tech University. “I’ve always liked numbers,” he said. Boroff began working at Evans in 2013 while he was a student at TSTC. He graduated in 2014 with an Associate of Applied Science degree in Electrical Power and Controls from TSTC. “I was a little older and took it seriously and I loved every minute of it,” said Boroff. Boroff credits Dylan Baugh, Evans’ chief operating officer, for encouraging him to go back to college. The two met when Boroff was a full-time Brazilian jiujitsu instructor in Waco. Some of Evans’ other employees have ties to TSTC. Michael Sullivan, a field service electrical service technician and Occupational Safety and Health Administration-certified hoist inspector, has worked at Evans for 18 years. He does a lot of on-site repairs and testing on electrical systems. He graduated in 1980 from Texas State Technical Institute (now TSTC) in Waco with an associate degree in laser electro-optics. Anthony Jentoft, 40, has worked for seven years at Evans and is a field service technician for wind turbine generators and motor testing. He said he cannot imagine doing anything else. Jentoft graduated in 1996 with an Associate of Applied Science degree in Automotive Technology from TSTC. He said some of the concepts he learned about engines are useful to today’s work. This entry was posted in Waco on August 19, 2018 by Daniel Perry.